The Lancet Countdown will be a 15-year investigation comprised of a collaborative force of 16 research institutions from around the globe. The study will publish research on the risks and opportunities of climate change and climate change mitigation respectively every year. To add to the urgency of the issue, WHO have estimated that 12·6 million deaths (23% of all deaths worldwide) in 2012 were attributable to modifiable environmental factors, many of which could be influenced by climate change or are related to the driving forces of climate change. 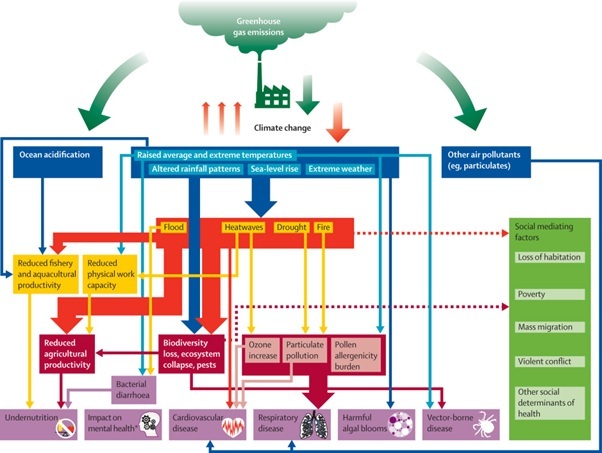 Indeed, the direct health impact of factors contributing to climate change are already severe. The Lancet notes that “an estimated 18,000 people die every day due to air pollution exposure, making it the world’s largest single environmental health risk.” The World Bank estimates that this costs the global economy $225 billion a year in terms of lost labour income. Preventative measures cross-cutting between climate and health have also been identified. The Lancet claims that active transport such as cycling and walking can prevent many of the 3.2 million deaths related to physical inactivity while also cutting CO2 emissions related to carbon-intensive transport. The launch of the Lancet Countdown has shone a global spotlight on the significant contribution that public health and healthcare practitioners can to contribute to climate action. CSH will be paying close attention to the knowledge and data arising out of this investigation and sharing it for you to stay updated. For more information, visit the Lancet Countdown official website.